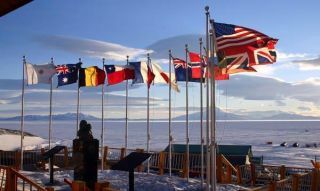 Flags fly outside McMurdo Station, one of three United States research station in Antarctica and the largest. Dutch science journalist Govert Schilling recently visited Antarctica's McMurdo research station on a National Science Foundation-sponsored trip for reporters. Here, the writer offers his first-hand take on science at the bottom of the world. In December, I spent some time at the Antarctica Hilton. This sounds much fancier than it really was. In fact, the "Hilton" is the nickname of a small shed at the intersection of two snow-covered "roads" in the vicinity of McMurdo Station, home base for American researchers on the southernmost continent, Antarctica. One of these roads led to the Long Duration Balloon (LDB) facility, a staging ground where high-altitude balloons carrying science experiments are launched. After I made a visit to the LDB, camp manager Scott Battaion had dropped me off at the "hotel," along with Shaul Hanany of the Univerity of Minnesota, the principal investigator of a soon-to-be-launched balloon experiment. Within a few minutes, a shuttle would pick us up for the remaining 6 miles (10 kilometers) or so to "McTown." Outside the shed, as far as the eye could see, there were snow-covered ice fields beneath a clear-blue sky, with white Mount Erebus — the southernmost active volcano in the world — gently smoking in the background. Shaul got a bit restless when the shuttle didn't show up for five, then 10, then 15 minutes. Personally, I didn't mind too much: The delay provided me with a chance to discuss the hottest episode in the history of the universe — the Big Bang — on the coldest continent of our planet — Antarctica. Finally, a small dot appeared on the horizon. It turned out that the four-wheel-drive van had gotten stuck in a snow drift. Half an hour later I was back "home," ready for dinner at the McMurdo galley, and hopefully some more interesting encounters with Antarctic scientists. An elevated dorm at NSF's Amundsen-Scott South Pole Station is shown with a new elevated station in the background. The photo was taken on Sept. 9, 2005. The Pole is currently experiencing a period known as civil twilight; the sun will not rise above the horizon until late September. Sure enough, the highlight of our visit was a day trip to the Amundsen-Scott South Pole Station on Dec. 10 — a flight of just under three hours for the propeller-driven military LC-130 Hercules freight carrier that is one of the few available aircraft able to land on the ice, using skis. "It's a very warm day," said station support supervisor Andrea Dixon. Indeed, the temperature was a balmy minus 17 degrees Fahrenheit, which felt like minus 35 degrees F with the wind chill (minus 27 degrees Celsius, which felt like minus 37 degrees C), which, by the way, was still low enough to numb your fingers if you took off your gloves for more than a few minutes to take photographs. Almost as daunting was the relative shortage of oxygen — the South Pole is at an altitude of 9300 feet (2835 meters) above sea level. Especially when wearing all the NSF-provided extreme-cold-weather gear, walking a flight of stairs became an exhausting endeavour. But in this forbidding frozen environment, you can't help notice that human presence is ultimately governed by the elements. Both the new, elevated South Pole Station and the Ice Cube Laboratory, where cosmic neutrinos are being studied, had to be designed in such a way that they can be cranked up to higher elevations in the future, lest they become buried under accumulating snow drifts. Meanwhile, all human edifices are inexorably driven toward the remote ocean, at a rate of about 33 feet (10 meters) per year, by the glacial motion of the Antarctic ice sheet. That's why the marker for the true geographical South Pole has to be relocated every year, in a small ceremony on New Year's Day. Obviously, it was exciting to visit the data center of the IceCube Neutrino Observatory (the actual observatory can't be seen at all — it consists of more than 5,000 sensitive detectors melted in 0.2 cubic miles, or 1 cubic kilometer, of polar ice). And it was thrilling to get a closeup view of the 10-meter South Pole Telescope, which studies the cosmic microwave background, also known as the "afterglow of creation" left behind by the Big Bang. Not to mention the excitement of discussing meteorite hunting with a NASA astronaut, and visiting the payload assembly hall for long-duration balloon flights. But what struck me most during my visit was the passion and perseverance of scientists — biologists, geologists and astronomers alike — in their quest for knowledge. They leave home and family behind for weeks or months on end. They fly to the most inhospitable continent of the planet, crammed up in the cargo bay of a Hercules. They have to attend classrooms and field trips to learn about survival techniques and safety measures in the harsh Antarctic environment. And then, they finally set off on their own expeditions, often working more than 12 hours per day, sleeping in tents, fighting the elements — all that to gain a better insight into the workings of our changing planet, its vulnerable biosphere and the vast universe it is part of. When I flew back to Christchurch, New Zealand, on Dec. 13, I left a frozen world full of mysteries, and a vibrant community of truth-seekers committed to unlocking these secrets. And I took something with me (in addition to lasting memories and hundreds of pictures): a small bottle with "the cleanest air in the world," sampled and sealed at NOAA's Atmospheric Research Observatory at the South Pole. It will remain on my desk as a reminder of the purity of Antarctica.